Below are some items I have for sale. Some belong to me and some belong to my customers. This page will change from time to time as items sell and new items are added. If you have any questions please call write or send an e-mail. If you send me an e-mail I'll send you larger pictures of this radio. 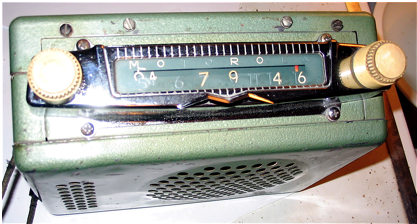 This 1952 Motorola Universal Model 401A car radio is owned by my customer, Nick. It appears to be in very good condition and has its original knobs on it. A mounting bracket is also included. This radio has not been electronically restored and I haven't tested it. 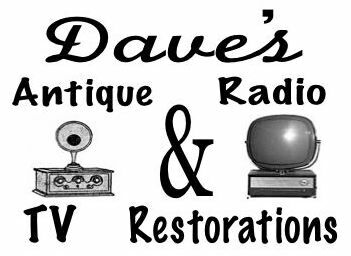 I believe Nick said that he wants $150.00 + shipping for the radio as it is, unrestored. If you call me I can have Nick call you to negotiate a price. Normally I would charge at least $165.00 to restore this radio. At most, I would charge $240.00 flat rate for the restoration. After purchacing the radio from Nick, if you're interested in the restoration of this all tube vintage car radio I'll give you a free estimate. Nick also has a Porche car radio for sale. Check here for details. This page will always be under construction.